i don’t have the fox soccer channel anymore. i could go up to brian’s during the summer and watch it whenever i wanted, but premiership hadn’t even started yet. so i watched re-runs of games while i could and now that it started, i can’t watch a thing. i can only keep track of the live scoring on the bbc’s premiership webpage. 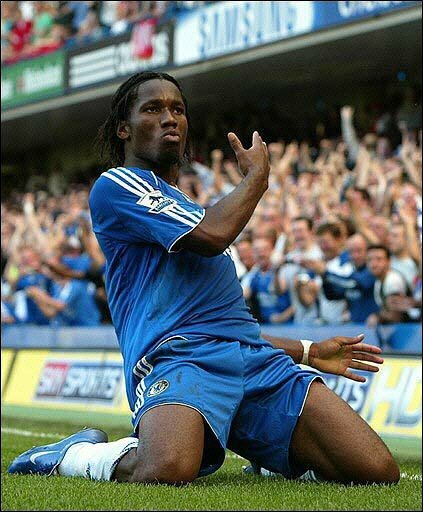 so you can imagine how excited i got when i saw thatdidier drogba had scored a goal against liverpool. and not just because he’s the captain of my fantasy team and i get double points when he scores. i got excited because he’s my favorite player in unamerican football. he’s even the wallpaper on my computer — ask anybody. anyways, i was glad that he scored but i was curious how it happened. then brian called. he told me that it was maybe the goal of the year. so i found a video of it on youtube. this morning i got online to read about soccer. to my surprise, there was a yahoo article on the chelsea-liverpool game. surprised because they provide almost as bad of coverage of premiership football as espn. so i started reading the article. it started out fine, talking about the goal: “The Ivory Coast striker settled a long ball from Frank Lampard in the 42nd minute, then swirled and drove a shot past Liverpool goalkeeper Pepe Reina.” but then i got to the third paragraph and stopped reading. “[tiger] Woods led the cheers from a front-row seat at Chelsea’s Stamford Bridge stadium.” who the eff cares if tiger stupid woods was at the game? how is that a key-point of the match? how does tiger woods cheering matter in any way? and who cares if he’s bff with shevchenko? i don’t. because i think shevchenko is a ball-hog. tiger probably would be one too, if he played soccer (not that he could last 8 minutes, but they’d be 8 minutes with zero passes). so i’m glad they’re best friends. anyways, is that the only reason that yahoo did an article on the game? because idiot-face tiger being at the game makes it news worthy? that is so ridiculous. i hate yahoo sports and i hate tiger woods. maybe that’s the only reason that yahoo even (sort of) covered the us open. nike must’ve told them that they were planning a promotion for the final where tiger would attend and cheer for whoever else was sponsored by nike (most likely federer). i watched the final and it was sweet. but i kept throwing up in my mouth because the one announcer (not mcenroe) kept talking about tiger woods the whole time. about how he and roger federer have so much respect for each other because they’re both dominating their sports and how it was federer’s dream to meet tiger woods and how when they met it was like they finally found someone who understood what it’s like to be at the top and how they’re probably going to be penpals and best friends. who cares about tiger woods? seriously. i’m glad he lost last week. it makes me happy. i like it whenever he loses. that’s the difference between him and federer. roger doesn’t ever lose. so if anyone was dying to meet anyone, it was tiger dying to meet federer. because he’s way cool and way good and who wouldn’t want to meet him. so tiger probably went to nike and told them that he’d give them all hand jobs if they arranged a meeting. and the people at nike probably accepted and decided that it would be a fantastic marketing stunt. so they pressured federer into meeting with tiger before the championship and they paid off abc so that they’d show as many close-ups of tiger woods as they did of roger federer. p.s. nice hat, idiot. that’s why i wish andy roddick had won. because he would never agree to something like that and mandy moore would never let him. not that i blame federer. just that i blame nike for ruining sports and tiger for ruining my life. and i blame yahoo for only liking american sports. if you’re going to cover a soccer game, yahoo, do it because drogba scored the sweetest goal ever. don’t do it because your boyfriend tiger woods happened to be at the stadium. iam one of the suporters of drogba and iam wishing tobe like him in my future well done drogba every where you where.